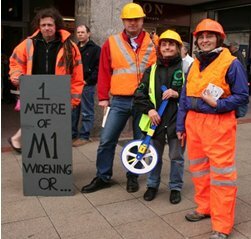 On Tuesday 29th May, Maureen from the Sheffield Friends of the Earth group joined others from the No M1 Widening group to protest at the cost of widening 115 miles of the M1. 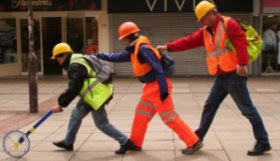 The protesters marched a kilometre through Sheffield city centre in protest at £5.1 billion plans to widen the M1. Maureen and others suggested using the money to provide solar power for homes. It was calculated that each metre of road widening could fit two homes with solar power. Maureen said to the local newspapers, “The government keep talking about climate change and yet which of these two ideas is going to make a difference to that? The Sheffield Star ran a poll in conjunction with their article about the event asking if the public agreed with spending money on green energy instead of widening the M1. 58% of the public agreed with us!